How can I edit my JQuery Form? How to edit my JQuery Form? JQuery Form comes with a Form Admin Panel. From Admin Panel, you can view form data, view debug message of connecting SMTP email server, email traffic log, and edit form. By clicking "edit" form link, it will read your form json config from form.config.php file, and post it to JQueryForm.com, so you can edit your form. Please remeber to download your form again and upload it back to your website. 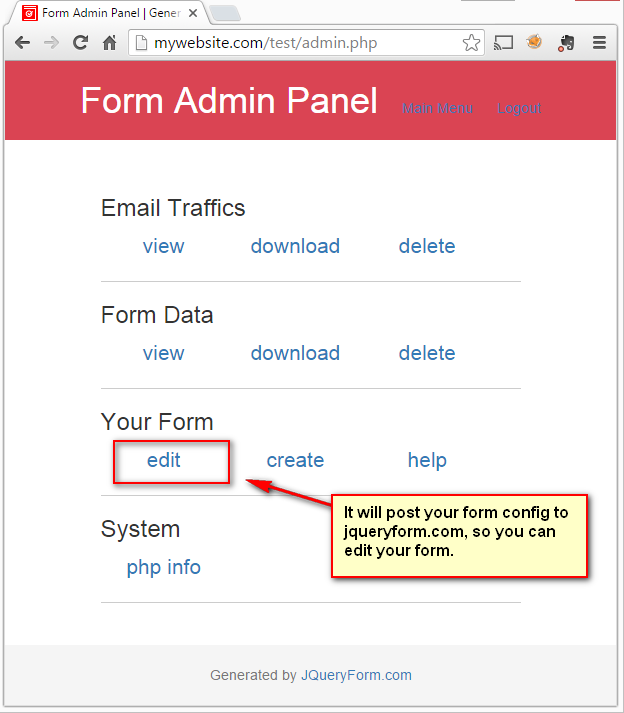 If you don't know how to access your JQuery Form Admin Panel, click here.